"Owner Operator 101" is an eBook for people who are thinking about becoming a truck Owner Operator. It helps you step-by-step from start to finish - from making the decision to implementing your plan and increasing your profit after you start your business. "OWNER OPERATOR 101" -- 2018 7th Edition. 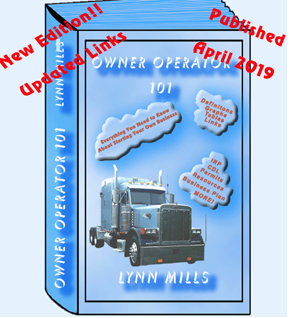 "Owner Operator 101" is an eBook for people who are thinking about becoming an Owner Operator of a truck. It helps you step-by-step from start to finish - from making the decision to implementing your plan and covers everything from registering your business to how to increase your profit once you get started. If you need a business license? If you need a business plan and how to write one? The difference in business structures (sole proprietor, partnership, and LLC)? Do you know what type of business structure you should have - and why? What kinds of licenses and permits you need for your equipment? What is TSA,TWIC, FMCSA, MC number and MORE? What kind of equipment you need for your operation and why (how to spec your tractor/trailer)? ALL THESE QUESTIONS AND MORE ARE ANSWERED IN THIS eBOOK. Clickable External Links: Every reference to an external source (such as the IRS, FMCSA or TSA) is accessible by a clickable hyperlink. No need for you to go on the internet and try to find the information. All you have to do is CLICK! You don't just go to the website, but whenever possible, I linked you directly with the correct page. Clickable Internal Links: Every internal reference (such as to a chart, definition, or different section) is also accessible by a clickable link, with easy return to your previous view so that you don't lose your place. Clickable Index Links: Every heading and page number is clickable. Color Coded Links: Links are color coded so you will know in advance if you will be staying within the confines of the eBook, or leaving it and going on the web. PDF format: You need a PDF reader, such as the free Adobe Reader©, to be able to read this eBook. See bottom of page if you need to get Adobe Reader©. It is preferable that you download to a computer, then sync with your mobile device. Printable format: Set up so it can be printed and fastened on one side of the page without interfering with the text. New and improved Cost Per Mile Calculator now also includes Miles Per Gallon. If you are trying to get started being an owner operator and I tell you that you need to register your truck, get an IFTA permit, and pay a Highway Use Tax – would you even know what I am talking about, much less where to look for the information? Well, don't worry, I explained each of those terms, then I looked up the addresses and web links for each state for business registration, and the addresses, phone numbers and web links for each state for IRP/IFTA registration. Couldn't you do this yourself? Sure, you could find a lot of this information yourself, IF you knew what you needed to look for, where to look for it and had 300 hours to kill I have done the work for you, spending well over 300 hours in researching web links for all the information you need to know about truck licenses and permits, business licenses, and state and federal agencies to support the information contained in this book. Also included are charts and tables illustrating some of the information talked about. Go to Owner Operator 411 to see a sample of my work. Everything discussed on this blog (and MORE) is in the book, but in much more detail plus charts and examples.